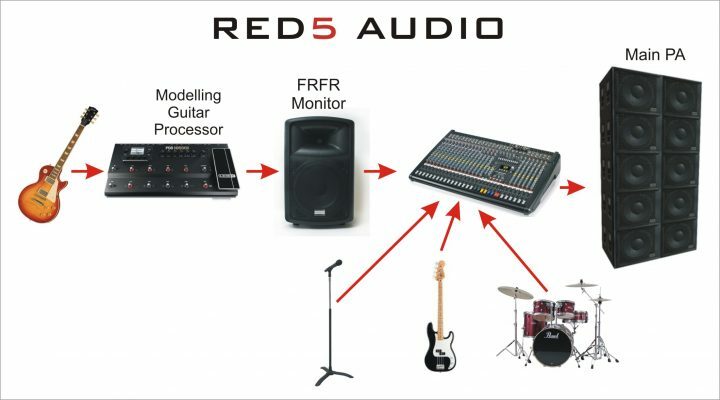 Can I use Red5 Powered PA speakers as an FRFR guitar amp? Yes, the RV210A and RV215A speakers are both ideal for use as FRFR speakers in a guitar setup. In this mode a traditional guitar amplifier is replaced with a full range speaker that is fed typically from an advanced guitar effects unit that has amplifier modelling built in. This means that the essence of the amplifier sound is modeled digitally so that it can be reproduced quite accurately when fed into a full range speaker. Using only one full range speaker you can have guitar, vocals and backing all coming through at the same time. If you tried to achieve this through a guitar amplifier the sound would be dreadful. You can practice at home and be sure that the mix will be the same as when you perform live. If you want to play through a larger PA system you can use the FRFR speaker as your monitor speaker and use the XLR output from the speaker to plug straight into the larger PA system. You don’t need to ‘mic up’ the speaker cabinet and the sound engineer will love you! 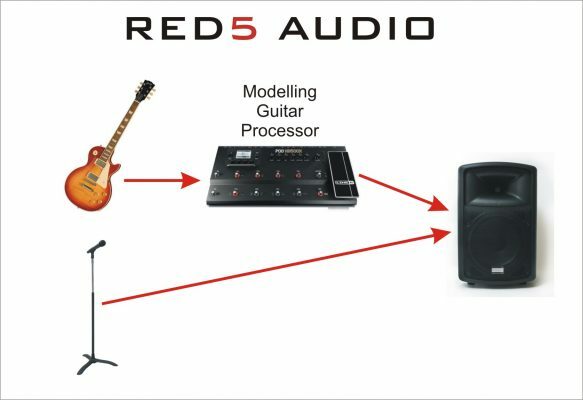 The Red5 powered PA speakers have 2 inputs allowing you to connect a guitar and microphone at the same time with no additional hardware required. 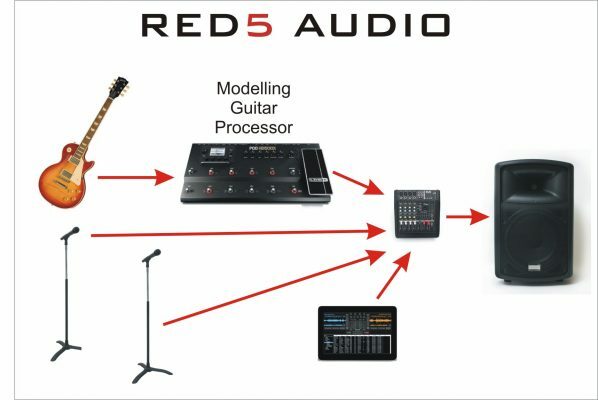 A more flexible setup can be achieved by connecting the guitar and microphone to a small 4 channel mixer and then taking the output from the mixer to the speaker. That way you can have the mixer close to hand if you wish to adjust the levels for a particular song. It also allows you to connect a CD player/laptop etc if you wish to play a backing track as part of the mix. Using a small mixer like this would also allow you to introduce a second singer or musician that would also come through the same speaker. The previous examples have looked at small scale operation for a single performer but on a larger scale as a player in a larger band the benefits are just as good. With a guitar amp as you monitor you’re never quite sure if you’re hearing the same as the crowd are hearing through the PA as that is dependent on the amplifier cabinet being ‘mic’d up’ well. With an FRFR setup you know that what is going into the large PA is the same as you’re hearing from the monitor. Are the RV210A and RV215A true FRFR speakers? Well yes and no. FRFR stands for Full Range Flat Response . Full range means is can produce a full range of sound (Bass mid and treble) whilst flat response means that it doesn’t colour the sound at all that’s fed into it. Now in a recording studio flat response is a desirable to make sure something is recorded exactly as its played. But in a live setup it’s less of a desirable in our opinion. PA systems tend to be heavier on the bass end than a flat response speaker would produce. So if you want to hear from your FRFR monitor speaker the same type of sound that the crowd will hear from the main PA system then you want a speaker with a response more like a PA system than a recording studio. FRFR has ended up becoming a term used for using a full range powered speaker in place of a guitar amplifier and not many of the speakers being sold as true FRFR speakers actually offer true flat response. That’s because if we’re honest, we don’t really want it, as to many ears it doesn’t sound as good. So if you want an ‘FRFR’ speaker that sounds like a quality live PA system then we’d recommend ours. If you want one that sounds like a clinical recording studio setup then you might want to try something else….. but you’ll be back! As Megan Trainer said ….. It’s All About That Bass.